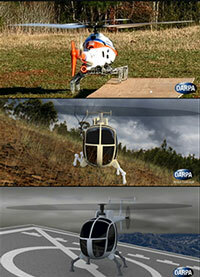 (Nanowerk News) Helicopters are incredibly maneuverable in the air, but during landing and takeoff their traditional skid- and wheel-based landing gear requires stable, flat surfaces—surfaces that are often unavailable in helicopter-needy environs such as forward operating areas, ships at sea and natural-disaster zones. Having the ability to land on and take off from angled, irregular and moving surfaces would greatly expand the effectiveness of helicopters across many military and national security missions. As part of its effort to provide such a breakthrough capability, DARPA has conducted an experimental demonstration of a novel robotic landing gear system. The adaptive system replaces standard landing gear with four articulated, jointed legs that are able to fold up next to the helicopter’s fuselage while in flight and are equipped with force-sensitive contact sensors in their feet. During landing, each leg extends and uses its sensors to determine in real time the appropriate angle to assume to ensure that the helicopter stays level and minimize any risk of the rotor touching the landing area. “The equipment—mounted on an otherwise unmodified, unmanned helicopter—successfully demonstrated the ability to land and take off from terrain that would be impossible to operate from with standard landing gear,” said Ashish Bagai, DARPA program manager. Bagai described the previously unreleased results of the flight demonstration at Wait, What? A Future Technology Forum, in St. Louis. The robotic landing gear system was developed with funding from DARPA’s Mission Adaptive Rotor (MAR) program, and is now undergoing continued development by the Georgia Institute of Technology.